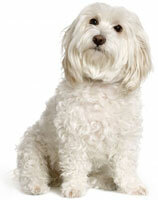 The enviroment around your Maltese can be the difference between beautiful, white hair or ugly, brown eye stains. Many things in the environment can cause dog tear staining. Eye irritation, allergies, or even fleas can contribute to dog eye stain. Carefully read through each of these environmental eye stain causes. Remove anything in the environment that may be causing your Maltese eye stain. This will result in your Maltese becoming happier, healthier, and even more beautiful. What dog tear staining solution worked for your Maltese? Tell us about it. Although most Maltese sport the short Maltese puppy cuts, hair can still get into their eyes. This causes irritation and excessive tearing. Solution - Pay careful attention to the hair around the face of your Maltese. Use barrettes or bows to keep your Maltese's hair away from her eyes. There are so many cute styles to experiment with. I usually use a barrette or tiny scrunchy to tie up Marley's hair. Smoke, shampoo, perfumes, and other chemicals can have an effect on your dogs tear stains. 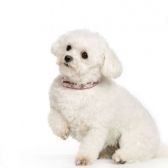 Many Maltese dogs are sensitive to certain shampoos and chemicals. Allergies in dogs can cause excessive tearing and lead to eye stain. Solution - To give your Maltese dog allergy relief, put eye drops in your dog's eyes before shampooing. If you notice a sensitivity to certain grooming products, use gentler shampoos and sprays. Products containing oatmeal and natural oils, instead of perfumes and chemicals, are best. Marley's groomer uses a gentle oatmeal shampoo. Believe it or not, fleas can actually make dog tear staining worse. Fleas need moisture to survive and can irritate your dog's eyes. Solution - Keep fleas under control at all times of the year. I use FrontLine Plus on Marley. It's so simple to just apply a few drops on her back every 3 months to keep the little buggers away. Most treatments also work on ticks. Kill two birds with one stone. Still have questions about dog tear staining? I've teamed up with a group of expert dog vets to help you find the answer. << Could Maltese Health Problems Be Causing Dog Eye Stain?